From: Product Roadmaps Relaunched, by Bruce McCarthy and others authors. 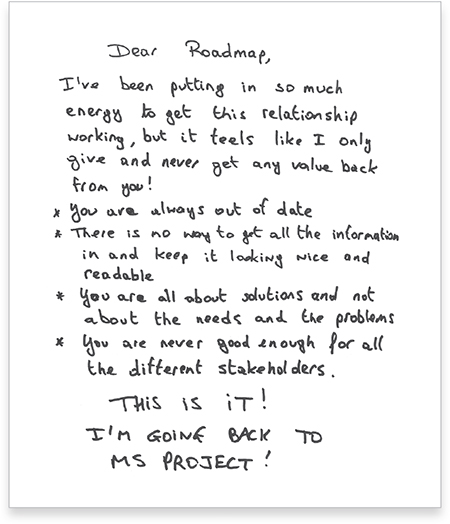 If these sentiments look familiar to you, you may be thinking “I don’t want to create a roadmap because it's too painful to maintain.” I'm sorry to say there is no magic solution to this problem. Just as your process and product are likely to adjust based on multiple feedback sessions, so also your roadmap will change to reflect evolving ideas. It's very important to remember, however, that roadmaps play a crucial role in product development and should not be discarded. Product leaders are the main channel for internal, and often for external, company communication. Using product roadmaps to improve communication can have a huge effect on internal product development alignment and external product buy-in. Today, let's examine a few ways to effectively create and maintain your product roadmap. What Should You Consider When Creating Your Product Roadmap? - Am I creating the roadmap so I can have a long-term view about the product or because I want to make my goals visible to stakeholders? - Am I including the right amount of information, or too much/too little? - Is my roadmap approachable for my development team while also pleasing for company decision makers? - Is my roadmap missing any market opportunity? 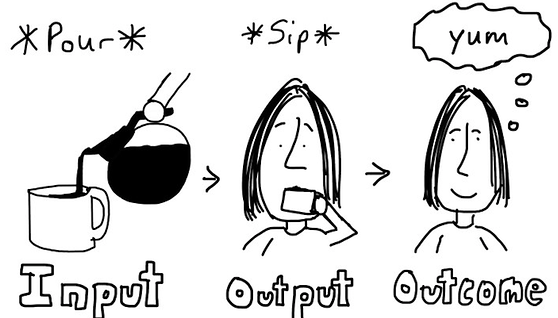 - Is my roadmap output driven or outcome driven? People tend to expect that product roadmaps will present a feature-by-feature wish list to communicate expected deliverables and deadlines, but you also want to use it to excite readers about your goals. How do you achieve both? A short answer is: Don’t deliver features. Deliver results. Use your product roadmap to show how your users and stakeholders will benefit from each delivery. - Today's best solution may not be tomorrow's best solution. Because of this, your team should understand what to achieve rather than what to deliver. - By over-defining a solution, you hamper (or even block) the creative process. You want your team to be innovative and visionary every day. If there is a better and smarter approach to achieving a particular outcome, be open to shifting your plans. - Delivering a feature does not equate to achieving a goal. Your feature will allow your users to do something new or different, but it doesn’t necessarily ensure successful results. That means that your delivered feature may or may not meet your original goal. We often hear clients and users say, “I want this” and “I want that.” As a product owner, it's essential to understand the core of the issue: sometimes, what clients and users say they want is not what they need. So start by carefully considering the "why" behind their requests. This will guide you to deliver satisfying results for your clients and users. Let’s look at an example of how to create a successful product roadmap. Suppose you are working on an e-commerce project and you want to find other ways to promote your products and sales through your own customers. You may decide to build an integration with an existing photo-sharing application so that your output will be something like: Instagram integration. While it's important to start by ideating an output and then asking "why" to discover your outcome, remember that no rule is set in stone: you may end up in a situation where your product roadmap needs to include a feature as well as a result, and that's okay. The goal, however, is to always ensure your roadmap effectively communicates desired results in a specific yet flexible manner. Have you started creating your own product roadmap? Are you facing too many maintenance challenges? Did you focus on communicating results? Did you think about the "whys"? Feel free to share your thoughts and questions in the comments below! Ramon Alves is a Business Analyst at Avenue Code. He is a motorcycle lover, an entrepreneur, and an Agile enthusiast.